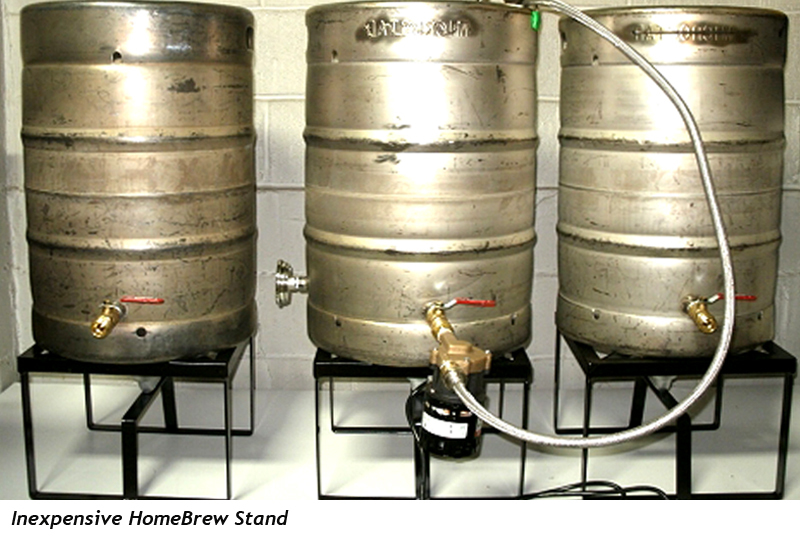 Home beer brewing stands, brew stands, homebrewing systems, stainless steel brewing racks and brewing sculptures! Stainless Steel Digital Homebrewing System! Estimated Retail: $6,495 Just Released By MoreBeer! This is the West Coast Brewer, top choice for a home brew stand and digital homebrewing system. This single tier stainless steel homebrewing rig is MoreBeer.com top of the line digital brew rig. The Low Rider homebrewing stand is a single tier BrewSculpture that allows you to interact with each kettle without the need for a step stool. Professional breweries like Sierra Nevada and Russian River us this brewing rig for their pilot test brewing. This brew rig comes with a control panel option granting you the ultimate in homebrewing control, flexibility and ease-of-use. It features a 7 inch touch screen, with resistive touch, it controls times and temperature, while reminding you when to make additions throughout the entire brewing process. Click the link or image for more details on this homebrew rig! 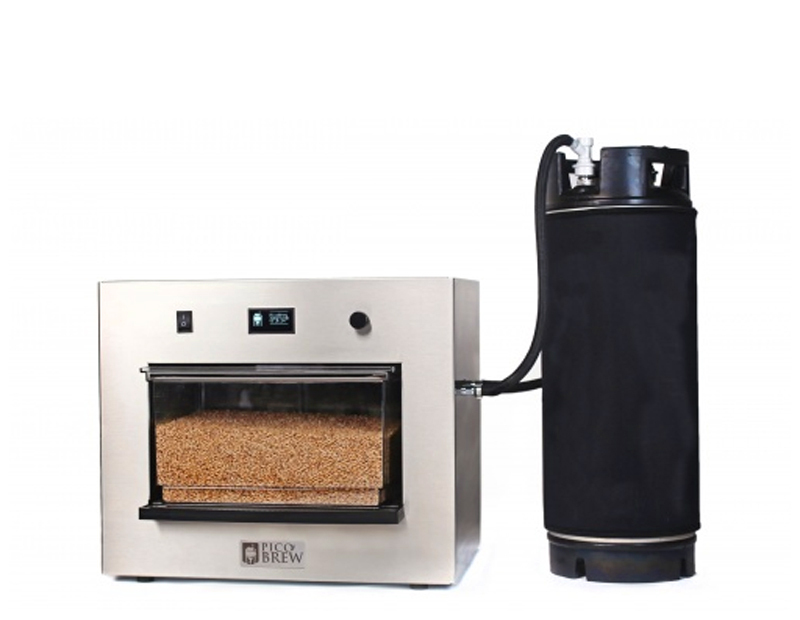 Estimated Retail: $1,939 The Brew Easy Electric Home Brewery is a small footprint brewing platform, ideal for brewers with a small brewing space. This system utilizes a two kettle recirculation infusion mash system called the KRIMS process. This system is simple to use and is an approachable way to transition from extract to all grain homebrewing. The BrewEasy provides all the simplicity of a brew in a bag (BIAB) system, but eliminates the cloudy wort, messy lifting, and provides great consistent efficiency. Click the link or image to order one. 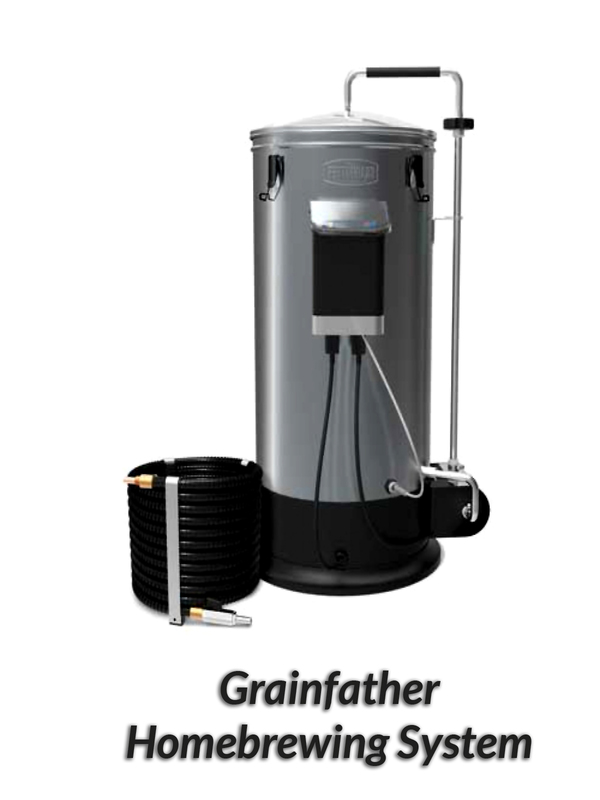 Estimated Retail: $890 Plus Free ShippingThe Grainfather is an all inclusive all grain brewing system. 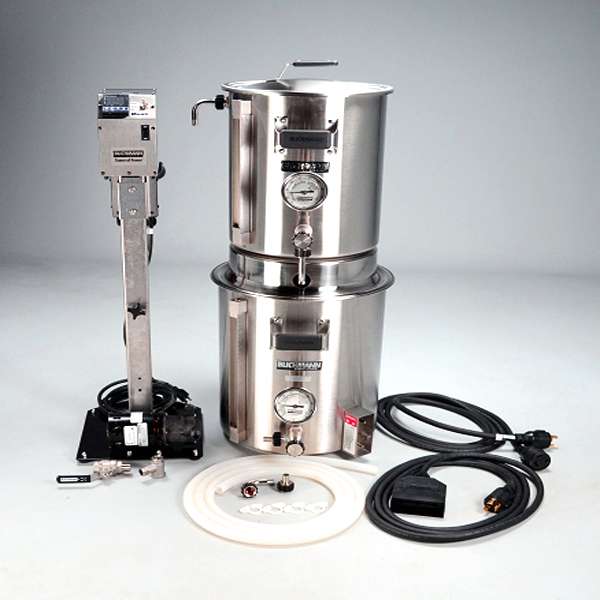 This Grain Father homebrewing system allows you to mash at high extract efficiency by utilizing a pump which allows wort recirculation throughout the mashing process. With the GrainFather Homebrew Rig, your mash tun becomes an electric boil kettle. Both the mash temperature and boil are all controlled precisely in the Grainfather homebrew system with an electric heating element. The system comes with a digital temperature controller so you can adjust temperature of your mash with in a degree. The Grain Father home brewer also includes a counterflow chiller for quick wort chilling. Click the link or image to order one. Single Tier Stainless Steel Home Brewing Stand! 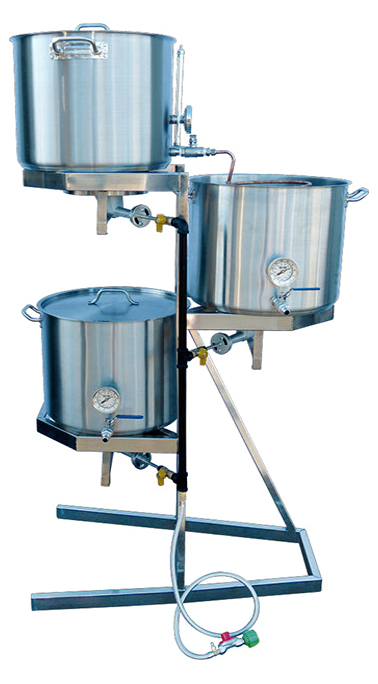 Estimated Retail: $3900 Stainless Home brew stand and homebrewing system. This single tier stainless steel home brewing stand is MoreBeer.com’s most popular variety and may be equipped for either ten-gallon or twenty-gallon home brewing batch sizes. They offer three different models of the Single-Tier BrewSculpture: Standard , Digital and Digital Deluxe. MoreBeer builds this home brewing stand for use with propane gas, however it can also be configured to use your homes natural gas line. Click the link or image to order one. 3 Tier Tippy Dump Homebrewing Stand! Estimated Retail: $3600 The Tippy-Dump Stainless Steel BrewSculptures \ 3 Tier Home Brewing Stand, brew rig is an advanced and compact style home brewery. You can empty out your entire mash tun when it’s full of spent grain by simply tipping it over! 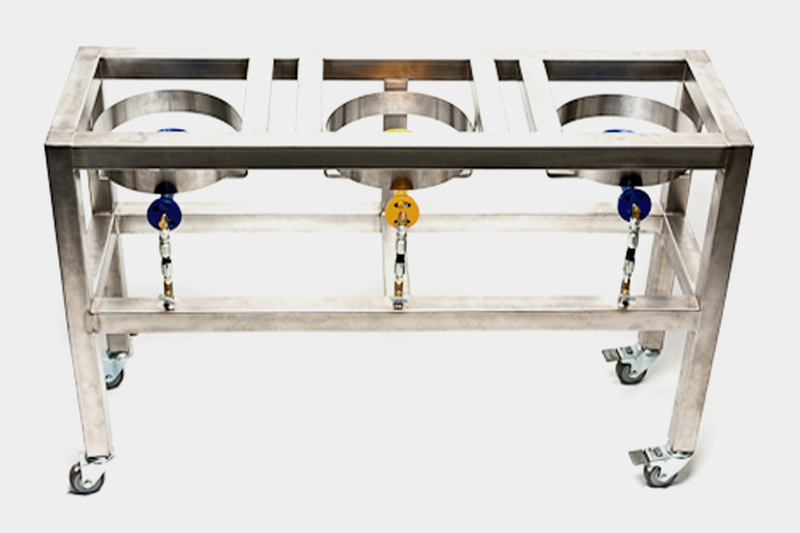 The Tippy-Dump mash system allows a single brewer to quickly and easily dump their spent grains down a stainless steel chute speeding up the cleaning process! 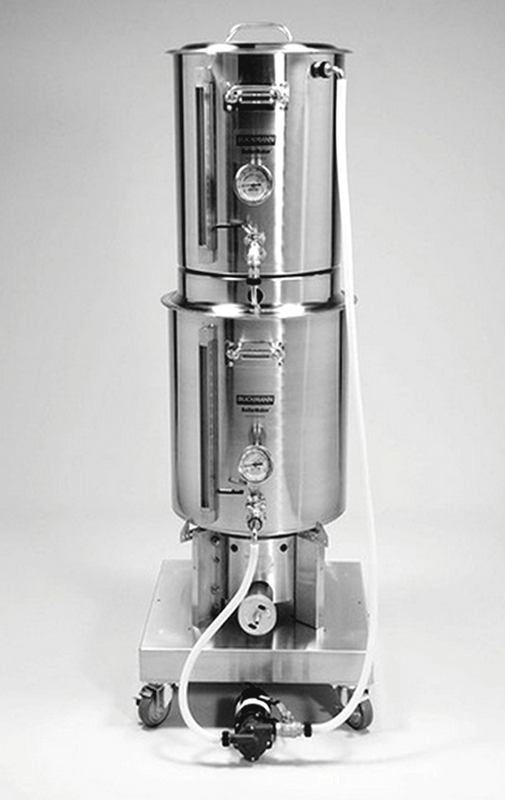 This stainless steel home brewery can be purchased to produce either ten-gallon or twenty-gallon batch sizes, and utilize one pump and gravity during the sparging process. This home brewing stand comes in three different models: Standard , Digital and Digital Deluxe. Click the link or image to order one. Estimated Retail: $299 The Brewer�s Edge Mash and Boil all in one home brewing system makes home beer brewing easy. No need for an outdoor burner, complicated brewing stand, or a 220 volt special circuit – it plugs into any 110 volt GFI household outlet. 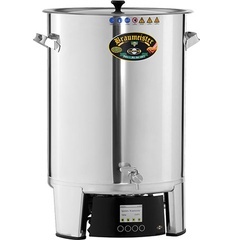 The Mash and Boil�s exclusive double wall stainless construction conserves heat to achieve a rolling boil with only 110 volts and 1600 watts, and its precise thermostat and internal sparging basket lets you mash and boil in the same vessel. Estimated Retail: $1,299 This stainless steel gravity fed homebrewing stand, homebrew setup is a classic space saving home brewery configuration. This stainless steel brewing rack has a shelf and burner for every kettle so it’s not necessary to lift a hot kettle above your head after heating the water up on your ground level burner. These gravity base home brewing sculptures are only available with fifteen-gallon kettles, which allow the brewer to brew between five and ten gallons per batch. Click the link or image to order one. Estimated Retail: $530 Like all Blichmann products, thier TopTier Homebrewing Stand is well designed and durable. 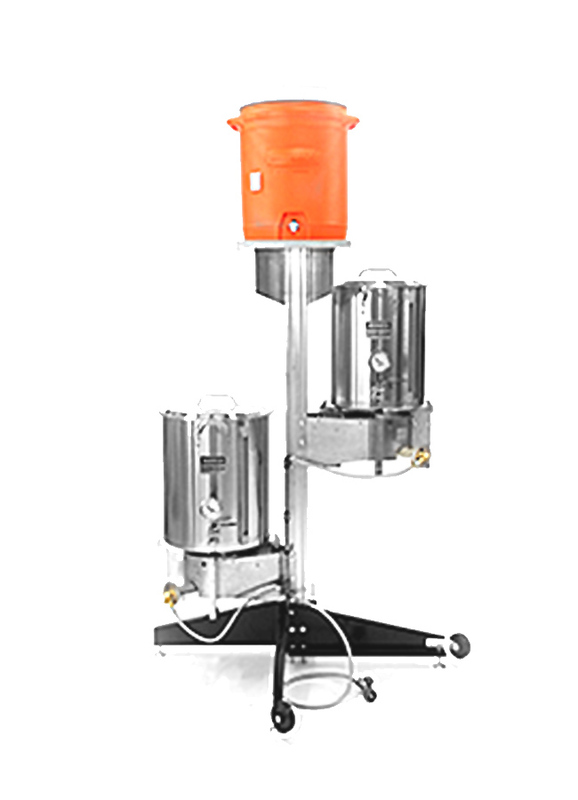 This brew stand offers a ton of flexibility and is compatible with existing Blichmann products such as their kettles up to 21″ in diameter and up to 30 gal, so that you can use your current brewing hardware if you currently own Blichmann brew kettles. This flexible setup also allows you to mix and match burners or shelves for each tier to suit your personal needs and individual home brewing process. Best of all the Blichmann brew stand quickly breaks down for storage if you do not have allot of space available. Estimated Retail: $799 The PicoBrew Zymatic Machine and the PicoBrew C make home brewing easy! 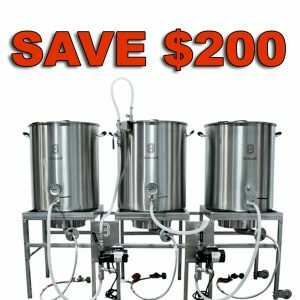 These are some of the easiest to use all grain home brewing rigs available. This simple and compact home brewery allows for efficient home brewing without all of the mess and complexity of some of the larger alternatives. The Pico Brew Zymatic Machine is the first of its kind and is a fully automated all-grain homebrewing appliance that allows the user to brew top quality craft beer at the push of a button. Estimated Retail: $2,025 The Blichmann BrewEasy, stainless steel brew in a bag home brewing stand is a newly designed ultra-compact home brewing system. This brewing stand allows a home brewer to brew all grain batches with a minimal amount of equipment. 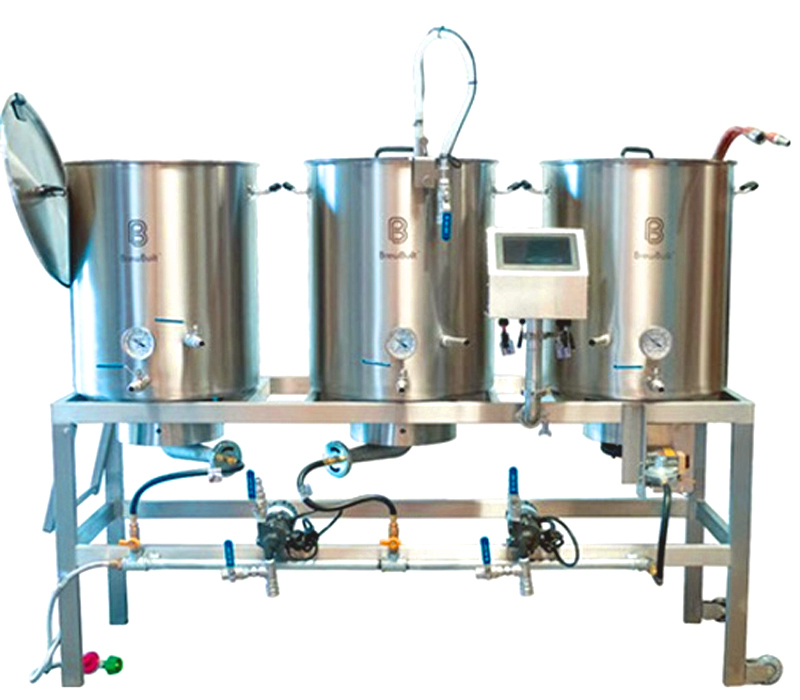 The Easy Brew stand utilizes a two kettle recirculation infusion mash system called the Kettle-RIMS process that is simple to use and makes it easy to make the switch from extract brewing. 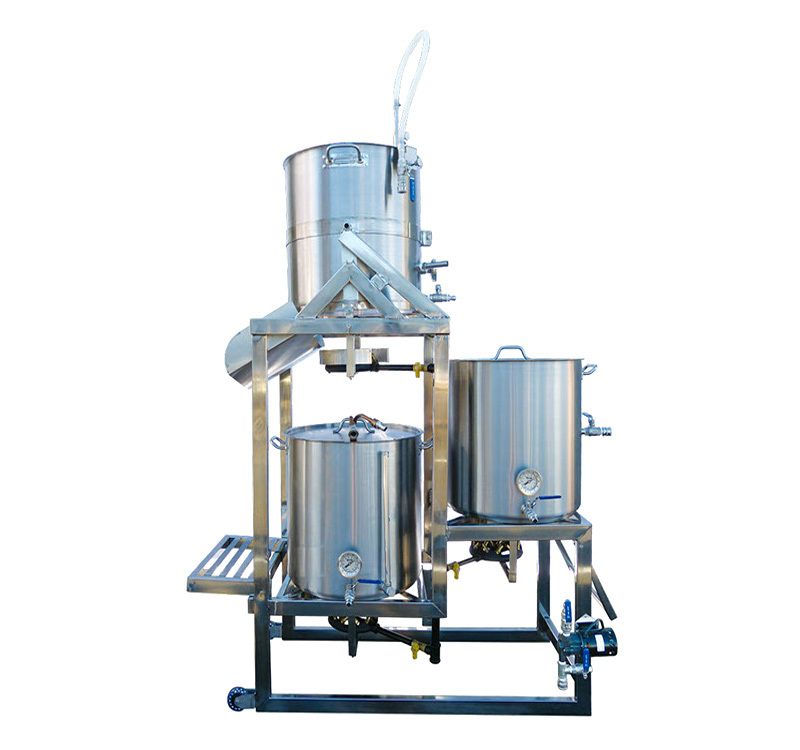 This stainless steel brew stand provides all the simplicity of a brew-in-a-bag (BIAB) system, but eliminates the cloudy wort, mess and has dramatically improved efficiency! 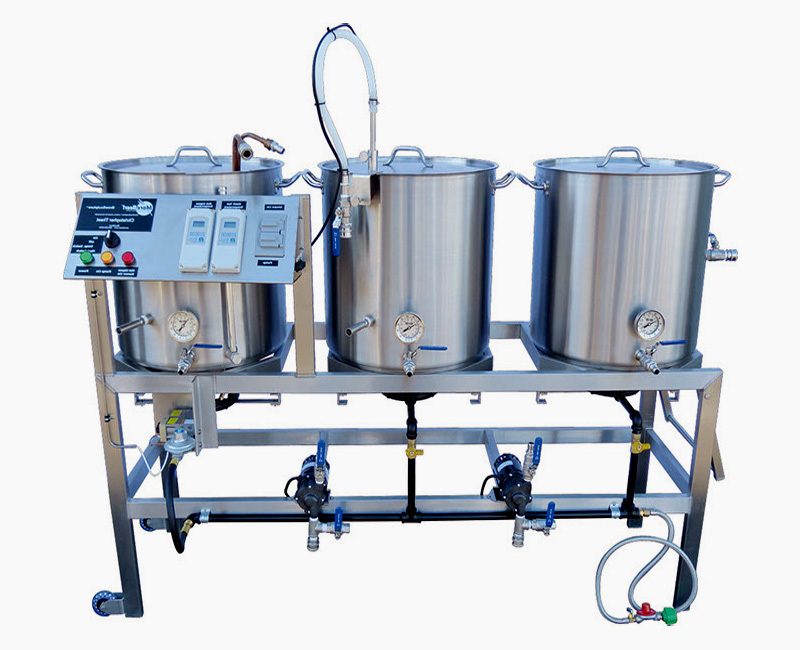 This Turnkey home brewery includes all of the necessary equipment to produce 5 gallon batches and there are also 10 gallon and 20 gallon versions available. Estimated Retail: $1,299 This is a single tier, all welded 2″ squared stainless steel tube frame construction Brutus home brewing stand. It includes 3 hp cast iron burners that are connected to one chamber for a 30 psi propane regulator with stainless steel hose via the Banjo Burner Orifice. It features legs with 2 rolling industrial casters and 2 locking industrial casters. It is a great choice for a low cost stainless steel home brewing stand where you want to utilize your existing kettles and pumps. Click the link or image to order one. Estimated Retail: $1,299 This homebrew stand is an inexpensive turnkey 15.5 gallon all grain home brewing system. It features recycled stainless steel kegs used as kettles and allows you to brew 12 gallon all grain beer batches. By default this brew stand comes with one pump to be used on your mash tun but requires manual sparging unless a second pump is added. This home brewery setup features optional upgrades allowing you to add an additional port to your hot liquor tank and boil kettle for installing a thermometer. This homebrew rack also comes with a 220,000 BTU 3 burner system to help you heat your water and wort quickly! Estimated Retail: $1,499 to $2,699 This automated homebrewing stand is a fully automated home brewery. The Braumeister homebrewing stand is an all-in-one electric all-grain brewing system. Perhaps best of all, is that unlike most brewing stands, this one ships to you free of charge from MoreBeer! This brewing stand is built in Germany but are imported and supported in USA by MoreBeer!. The Braumeister homebrewing stand features an automation ease of use that is unparalleled in brewing all grain beer batches at home. This beer brewing rig is also compact if space is an issue!